South Tampa SongFest, Monday, October 4th at 7:00 p.m. at the Bayshore Baptist Church. Admission s $5.00. Please e-mail jkent@stjohngreekorthodox.com for more info or go to www.tbcchorus.org. Third Annual Sporting Clays Celebrity Challenge, Saturday, October 23rd at Pine Creek Sporting Clays. Welcome to St. John's website. Since 1967, St. John has offered a program that fosters academic excellence in a nurturing environment. We keep our classes small to allow our faculty to concentrate on the individual learning styles of each student. We offer an exciting curriculum in a new classroom building that features state-of-the art computer and science labs. We encourage our students to be leaders, to be involved in the community, and to stay current with events around the world. We want our students to have the solid academic foundation that prepares them for a future of endless possibilities. When our students leave St. John, they are capable of doing their absolute best to make a difference in the world. At St. John we are a family. We create programs in the classroom and on the athletic field, that promote students in different grades to work together. We want our parents to be involved through our Parent Teacher Support Organization (PTSO), our Dads' Club, in our library, in the classroom, and a variety of other ways. 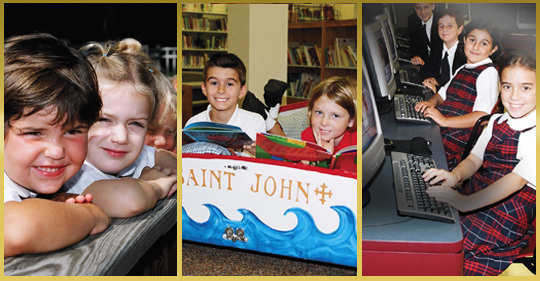 If you are thinking about St. John for your child, entering K3-Grade 8, I encourage you to visit St. John firsthand. Please feel free to call our Admissions Director Judy Kent at anytime to schedule a tour of our facilities and see the enthusiasm of our faculty and students. ©2017 St. John Greek Orthodox Day School. All Rights Reserved.